Updated 11th March: David Essex 1974 co-stars, Marti Webb, Gay Soper, Tom Saffery, Deryk Parkin and Jacquie Ann Carr are confirmed to join him on stage at the end of the evening. Julie Covington, who was also in the original cast, will be abroad and unable to attend, but it is still hoped that Jeremy Irons - who played John the Baptist - can join them, subject to filming commitments. 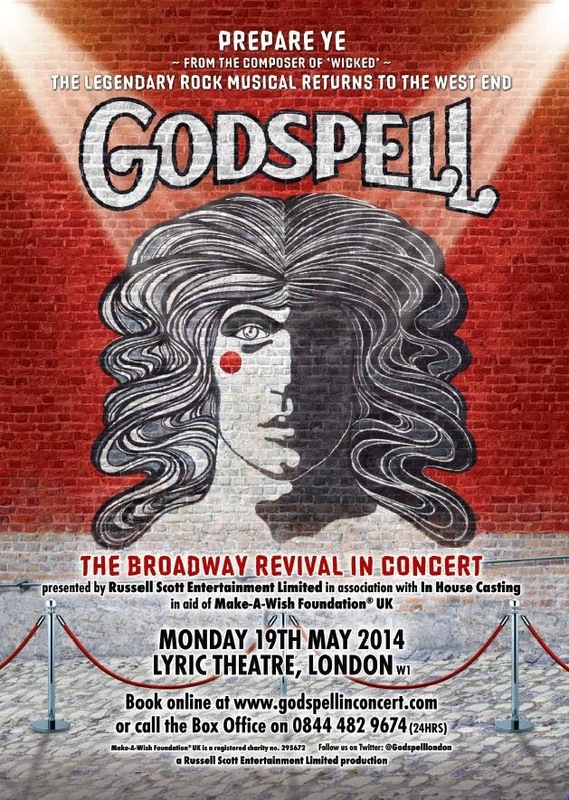 As already mentioned, the rock musical GODSPELL is to return to the West End 42 years after its premiere as a one-off charity gala concert performance in aid of Make-A-Wish Foundation® UK. The line up has just been announced with original West End cast member David Essex (he played Jesus) hosting the event at the Lyric Theatre on Monday 19th May at 7:30. Performers include Zoe Tyler and Andy Abraham with a West End cast, live band and 32-strong choir led by members of Maida Vale Singers and American Musical Theatre Academy. Zoe Tyler was until recently a regular presenter on ITV1’s Loose Women. She first appeared in the West End as Fantine in Les Misérables, the tour of Jesus Christ Superstar, City of Angels, the Narrator in Joseph and singing legend Eva Cassidy in Over The Rainbow. Since coming second on The X Factor in 2005 Andy Abraham has sold out the Royal Albert Hall and released four albums selling over half a million records. The rest of the cast includes: Stewart Clarke (Sam Wheat in the UK tour of Ghost), Rob Houchen (Marius in Les Misérables), Sarah Galbraith (The Phantom of The Opera), Katie Paine (We Will Rock You), Turlough Convery from E4’s Fresh Meat (Stephen Sondheim Student Performer of the Year), Jason Broderick (Sweeney Todd ) and Laura Darton (finalist in the Stephen Sondheim Society Student Performer of the Year 2013).